Sample invitation letter to friend for visit of my city and area to show him the beauty of nature as well as infrastructure of the city. I am glad to hear from you for passing a prosperous life with your family. I am also happy in my life and enjoying good health as well. It has been a long time since we met and I really miss you. As you know that we are friends from our childhood and have spent a long time together in school. After that, we did have to be apart from each other and you settled in another city. In brief, I want to spend some time with you and for this purpose the best option I have in my mind is your visit to my city. Several times you have expressed your wish to visit and see Glasgow city and this is the best chance to make it true. You must have known the beauty of Glasgow and its surroundings then come here and visit our city thoroughly and spend time with your childhood friend. My family and I will be honored if you come here and visit Glasgow. Glasgow is one of the most beautiful cities in Scotland and I assure you that you will conform to its environment and enjoy idyllic time with us. 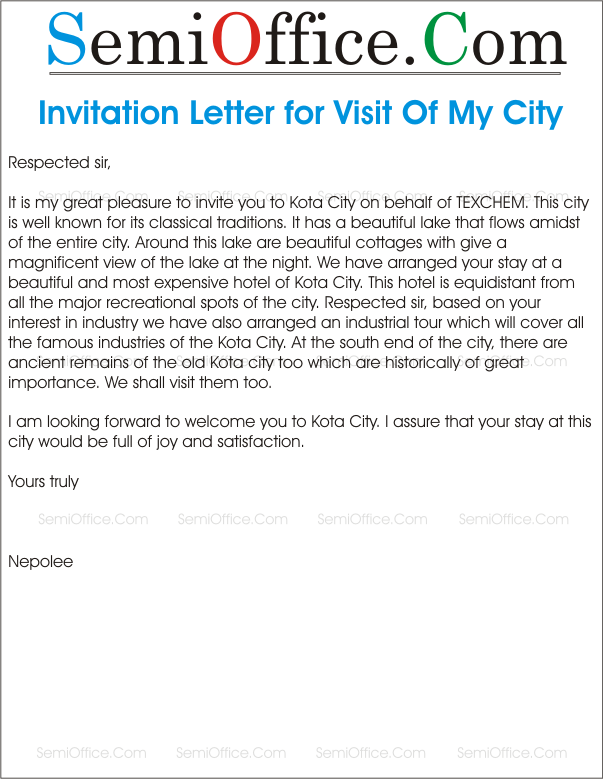 It is my great pleasure to invite you to Kota City on behalf of TEXCHEM. This city is well known for its classical traditions. It has a beautiful lake that flows amidst of the entire city. Around this lake are beautiful cottages with give a magnificent view of the lake at the night. We have arranged your stay at a beautiful and most expensive hotel of Kota City. This hotel is equidistant from all the major recreational spots of the city. Respected sir, based on your interest in industry we have also arranged an industrial tour which will cover all the famous industries of the Kota City. At the south end of the city, there are ancient remains of the old Kota city too which are historically of great importance. We shall visit them too. I am looking forward to welcome you to Kota City. I assure that your stay at this city would be full of joy and satisfaction. very interesting site keep it up guys..